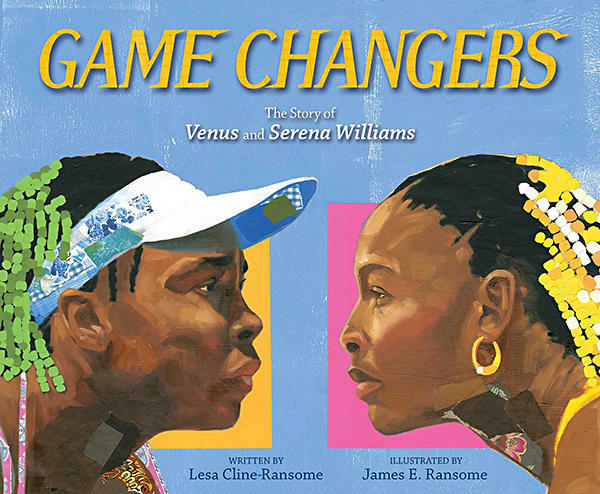 GAME CHANGERS: The Story of Venus and Serena Williams written by Lesa Cline-Ransome and illustrated by James E. Ransome is a fascinating picture book biography of two incredible athletes and sisters. The book traces how Venus, born in 1980, and Serena, born in 1981, were trained in the game of tennis by their parents each morning before the sun was up. They practiced at the East Compton Park public courts near their home. The girls stretched and did routines to build strength, speed and flexibility. The sisters hit hundreds of balls before each school day began! Venus won all of her sixty-three junior tournaments by age ten. She played her first professional game when she was fourteen. Both girls quickly rose in the ranks, won Olympic Gold Medals and by 2002 ranked first and second in the world! GAME CHANGERS: The Story of Venus and Serena Williams written by Lesa Cline Ransome and illustrated by James E. Ransome is a striking picture book biography for ages 4-8 about family, hard work, determination and love between sisters (Paula Wiseman Books/Simon and Schuster Books for Young Readers, 2018). Turn to the marvelous picture of Serena Williams with arms held high above her head in victory after winning the 2002 French Open against her sister and moving ahead of her in the rankings for the first time. How do you think she felt? Have you ever had a similar feeling? Think about various kinds of personal victories you have had in sports or perhaps in math, science or the arts. Draw a picture of how you felt.